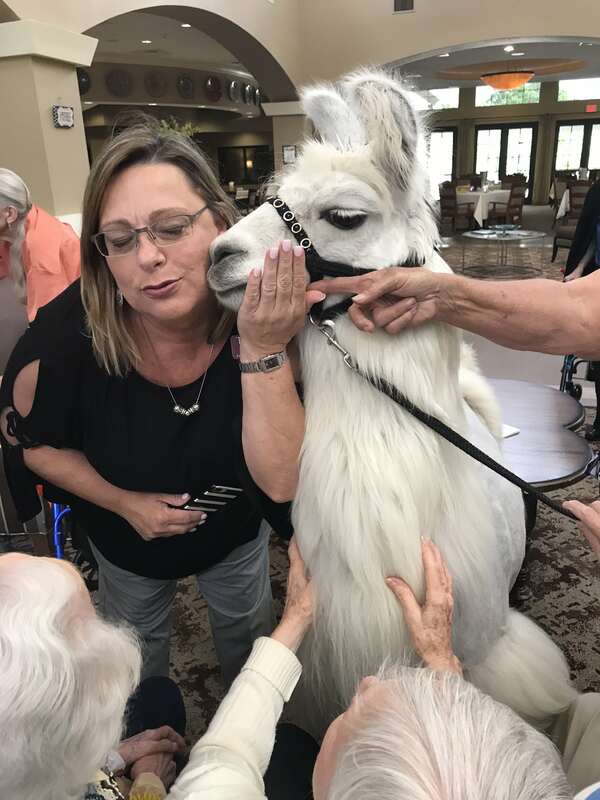 We all adore pets, but when llamas come to visit, it is extra special. 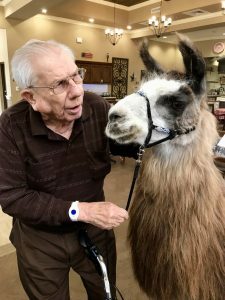 These big, soft, fluffy, gentle animals visited our residents last month and brought so much joy and comfort to our residents. We cannot wait to welcome them back soon. As we lose certain skills to aging, pet therapy is used to compensate. The key is to pique the curiosity of our seniors and keep them engaged. There are many benefits of therapeutic animals. One of the most crucial benefits is sensory stimulation: which includes hugging, caressing, kissing and hand holding. For memory care, sensory knowledge becomes a much more important way to navigate the world. Our memory care residents at Tuscan Gardens® deserve to enjoy meaningful activities. They deserve to be loved and pet therapy provides that extra support which is so beneficial to their well-being.